For cables, the program automatically assigns the names C-1, C-2, C-3, and so on. The bus from which the cable connects, which must already exist on the one-line. You must be careful that the From Bus has the same base kV as the cable’s To Bus. For your reference, the From Bus base kV is displayed next to the bus name. The bus to which the cable connects, which must already exist on the one-line. You must be careful that the To Bus has the same base kV as the cable’s From Bus. For your reference, the To Bus base kV is displayed next to the bus name. The phase of the item. Currently, this is for reference only. Show Entire Line This box is selected by default and causes the entire line to be displayed. By clearing the check box, the line is only shown as a short section at each end with labels indicating the bus to which the other end is attached. The style of the line that appears on the one-line. This setting is specific to the selected item and overrides any default styles specified for the equipment. The weight of the line that appears on the one-line. This setting is specific to the selected item and overrides any default weights specified for the equipment. 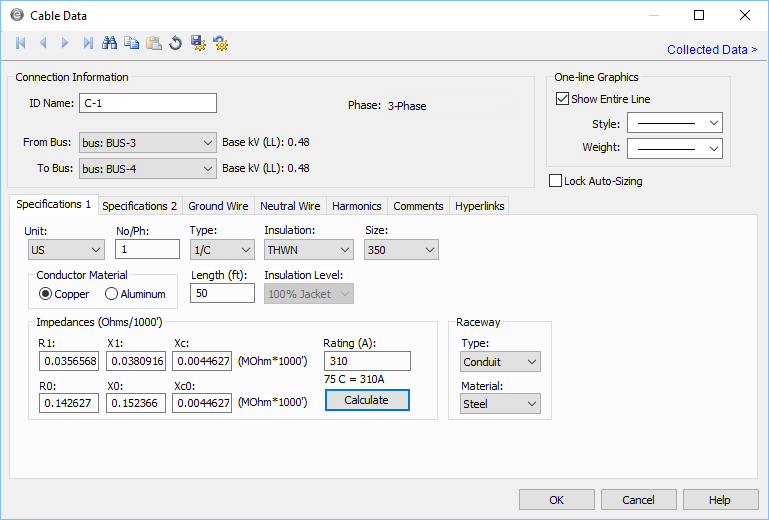 Lock Auto-Sizing While sizing cables with SmartDesign™ (the auto-design feature), the cable data is not changed if this field is selected. However, an auto-design report is created for the cable to show what would have been designed. Use this field to prevent cable data from being changed in SmartDesign™. Unit Choose either U.S., CSA, Metric or Per Unit. If you choose Per Unit, all fields except those in the Impedance (PU) section become unavailable. No/Phase Total number of cables modeled. The default of one (1) means one conductor per phase. Two (2) means two conductors in parallel per phase, and so on. When two or more conductors are in parallel, the impedance of the circuit is decreased by that factor. The impedances shown in the dialog box are for one conductor only, and are not based on the No./Phase field, so if you enter these values instead of using Calculate, make sure they are for one conductor only. This lets you easily check handbook values without additional arithmetic. The per-unit impedances listed in a database report considers the total number of conductors. Five different cable types can be modeled. Cable type is used in determining the impedance of the conductor. 1/C - One conductor. Three separate conductors are used for a circuit, one each for A phase, B phase and C phase. 3/C - Three conductor. This is the same as three separate conductors, except that the conductors are encased with an insulated overall outer jacket effectively forming one cable. The cable may or may not have an interstitial ground wire. IAA - Interlocked armor aluminum. This is the same as the three conductor cable except that the outer jacket is made of aluminum instead of protective insulation. IAA is a generic term for describing any type of aluminum jacket including continuous sheath products such as Okonite CLX. IAS - Interlocked armor steel. This is the same as IAA except that the outer jacket is made of steel instead of aluminum. MAC - Messenger aerial cable. Messenger aerial cable is three separate conductors bundled together with a messenger cable easy hanging from poles. Because the conductors are held in a triangular fashion with the bundling, the impedance of this configuration is the same as for the 3/C cable. Note: For Teck cables, select the CSA unit. For single conductor Teck, select 1/C and for 3-conductor Teck, select IAA for aluminum armor or IAS for steel armor. Look for Teck or Teck-90 in the Insulation type. EPR - Ethylene Propylene Rubber. RH - Heat Resistant Rubber, 75oC. RHH - Heat Resistant Rubber. RHW - Moisture and Heat Resistant Rubber. This is the 480 volt equivalent of EPR. THHN - Heat Resistant Thermoplastic. THWN - Moisture and Heat Resistant Thermoplastic. THW - Moisture and Heat Resistant Thermoplastic. TW - Thermoplastic insulated moisture resistant cable. XHHW - Moisture and Heat Resistant Crosslinked Synthetic Polymer. This is the 480 volt equivalent of XLPE. XLPE-133% - Crosslinked Polyethylene with 133% insulation. XLPE-NJ - Non-Jacketed Crosslinked Polyethylene. XLPE-NJ-133% - Non-Jacketed Crosslinked Polyethylene with 133% insulation. XLPES - Shielded Crosslinked Polyethylene. XLPES-133% - Shielded Crosslinked Polyethylene with 133% insulation. EPR-133% - Ethylene Propylene Rubber with 133% insulation. EPR-NJ - Non-Jacketed Ethylene Propylene Rubber. EPR-NJ-133% - Non-Jacketed Ethylene Propylene Rubber with 133% insulation. EPRS - Shielded Ethylene Propylene Rubber. EPRS-133% - Shielded Ethylene Propylene Rubber. PILC - Paper Insulated Lead Sheath. PILC-133% - Paper Insulated Lead Sheath with 133% insulation. Denotes whether the selected insulation type has extra thickness for a higher level of insulation. Examples include 100% or 133% for the selected insulation type. Size Conductor size in AWG, MCM, or mm2. 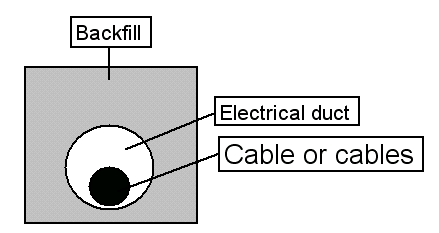 Cable size is used in determining the impedance of the conductor. Conductor Material The conductor material (copper or aluminum). Length Length of the cable in feet or meters. Impedances are described as Ohms/1000 feet, Ohms/KM or PU. Zero sequence impedances are described as the positive sequence impedance using a Z0/Z1 multiplier by Kaufmann1, specifically, on page 7. The resistance values are used in power flow, ANSI short circuit, harmonics, dynamic stability and auto design analysis. For IEC 60909 short circuit, separate resistance values are used. Maximum short circuit currents use resistance at 20°C. Minimum short circuit currents use the resistance at the final conductor temperature at the end of the short circuit. EasyPower calculates these resistances based on the resistances R1 and R0 and the Field Temperature of Conductor from the Specifications 2 tab. If you enter the R1 and R0 values manually, be sure to set the Field Temperature of Conductor to get the appropriate resistances for IEC short circuit. The Database Browser shows the per-unit resistances for maximum and minimum short circuit currents. Positive sequence capacitive reactance. The unit is Mohm*1000ft or Mohm*1000meters. Note: Capacitive reactance is ignored in analysis if you enter a zero here. Zero sequence resistance. If you enter this value as zero (0.0), the positive sequence impedance is used. X0 Zero sequence reactance. If you enter this value as zero (0.0), the positive sequence impedance is used. Rating Conductor rating in amperes. If you use Calculate, this value is retrieved from the device library and is for one conductor. You need to input the proper rating. The 75(C) rating is shown, to indicate lug ratings, below the rating field if calculate is used to determine the rating (low voltage only). 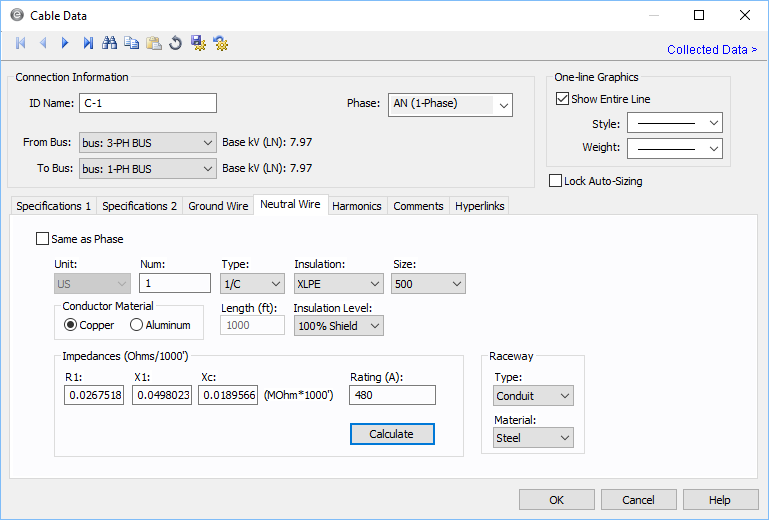 You can derate cable amp rating based on ambient temperature and the number of conductors in conduits or raceways by specifying the Ambient Temp and the Duct Config field in the Specification 2 tab of the dialog box. For the Ambient Temp derating to take effect, you need to specify the derating standard in Tools > Options > Equipment. 1 General Electric Wire and Cable Handbook, March 31, 1983. Medium in which the conductor is supported or run (conduit, cable tray, air, or direct buried). If none is selected, the cable ampacity defaults to 10A. Note: For buried conduits, you can apply the derating for ampacity in the Duct Config field on the Specifications 2 tab. Material Raceway material, which can be either metallic such as steel, or non-metallic such as aluminum, PVC, IMT, or EMT. This value is used in determining reactances. Rating (A) Ampacity of the DC Cable. Note: Doubling of Cable Length—Since DC systems are not “balanced,” cable runs need to simulate the total out and back DC resistance. Thus, internally, all DC line lengths are doubled to properly simulate the total voltage drop correctly. Note: All fields have a substantial effect on conductor impedances when using the Calculate button. Temperature of the loaded conductor. This can be varied from 25C to 250C depending on the type of study being performed. Cable temperature is used in determining the resistance of the conductor. The resistance increases with the conductor temperature. Note: This is not the ambient air temperature or the ground temperature. Distance between the outside insulation or jacket edges of adjacent phase conductors. This will affect the reactance calculations. All three spacings are modeled as the same or as a GMD equivalent. Note: This is not the center to center distance. See figure below. This field allows for cable ampacity derating based on the number of conductors in the conduit, tray or duct. Select from D-1, D-2, and so on, which correspond to NEC Detail 1, NEC Detail 2, and so on, of the National Electric Code. If this field is left blank, a 1.0 multiplier is assumed for the ampacity calculations. The rating factors are stored in the standard device library and can be customized if needed. If you need to derate cables based on number of conductors in the conduit or tray, you can add to the library. For a complete listing of duct configurations, please see article 310 in the National Electric Code. Ambient Temp Ambient air temperature. This is used for ampacity derating based on the standard selected in Tools > Options > Equipment. You can choose US (based on NEC), CSA (based on CEC) or <None> in the Options. No derating is applied when the option is <None>. Lay of the conductor, which affects the impedance. 3/C, IAA, IAS, and MAC configurations are always defined with a triangle configuration and zero spacing even if you choose a different configuration. Single conductor cables, however, can be in flat, triangle or a right triangle configuration with any spacing factor. Conductor Form Conductor form is determined by the extrusion process of the copper or aluminum. Select either round or sectored. Conduit Size & Num Size and number of conduits. This does not affect the impedance or ampacity calculations, but is stored as data. 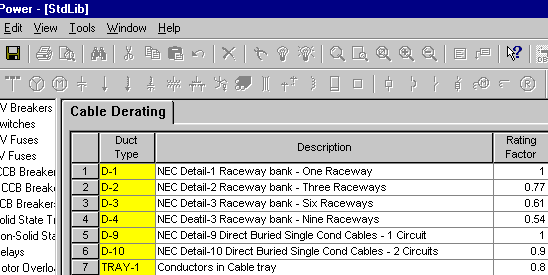 SmartDesign™ populates this field while automatically sizing the cables. The size appears in inches or millimeters depending on how Units are specified on the Specifications 1 tab. Ground conductor type (none, interstitial, separate, or as part of a group of conductors). This choice has an effect on the zero sequence impedance calculation. See Reference2 below for more information on ground impedance calculations. 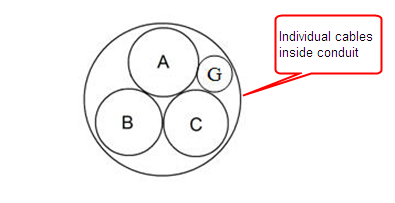 Interstitial: The ground wires in a three conductor cable (or IAA, IAS, CLX, TEC). Typically, there are three bare ground wires spaced evenly between the phase conductors. Separate: A separate ground conductor in a conduit for a specific circuit. Group: A ground conductor in a duct bank or tray that is used for multiple circuits. Num Number of ground wires in the circuit. This value is for reference only and does not affect analysis. Ground conductor size. This value is for reference only and does not affect analysis. Note: The size of ground wire may not have a direct influence on the effective zero sequence resistance (R0) and reactance (X0). Refer to Kaufmann’s paper2 on grounding. For steel conduits, ground currents flow through the conduit close to the outer surface because of skin effect. Material Ground conductor material. This value is for reference only and does not affect analysis. Insulation Type of insulation for the ground wire. Select <None> for bare conductor. This value is for reference only and does not affect analysis. All neutral wire fields are for reference only and do not affect analysis. Not applicable to DC cables. Num Number of neutral wires. Size Size of the neutral wire. Rating Amp rating of the neutral conductor. Enter amp rating based on size. Material Neutral material type (copper or aluminum). Insulated Whether or not the neutral conductor is insulated. For single-phase cables, you can set the cable specifications to be the same as phase or you can modify them individually. I f you select Same as Phase, the cable values are copied from the Specifications 1 tab to the Neutral tab. If you clear Same as Phase, you can enter the cable specifications for the neutral wire. Note: Not applicable to DC cables.